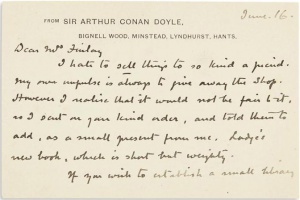 This letter was written by Arthur Conan Doyle on 16 june (ca. 1929-1930) to Mrs. Finlay from Bignell Wood, Minstead, Lyndhurst, Hants. I hate to sell things to so kind a friend. My own impulse is always to give away the shop. However I realise that it would not be fair to it, so I sent on your kind order, and told them to add, as a small present from me, Lodge's new book, which is short but weighty. This page was last edited on 13 April 2017, at 23:54.